Welcome back decorating enthusiasts to another edition of the Team Santa Inc. E-News. Today we have a delightful promotion going on that includes none other than our very popular Happy Easter sign. Use this popular lighted decoration on your front lawn or you can hang it from your garage, deck, railing, or anywhere that’s convenient. You can use cable ties or short pieces of wire to hang the frame. Installation is a snap because the unit is one piece with LED string lighting is already pre-installed using plastic clips to attach the string lights to the metal frame. The clips enable all the bulbs to point in the same direction which makes the decoration look impressive at night. Orders ship in approximately 24 hours via FEDEX 3-5 day ground service. 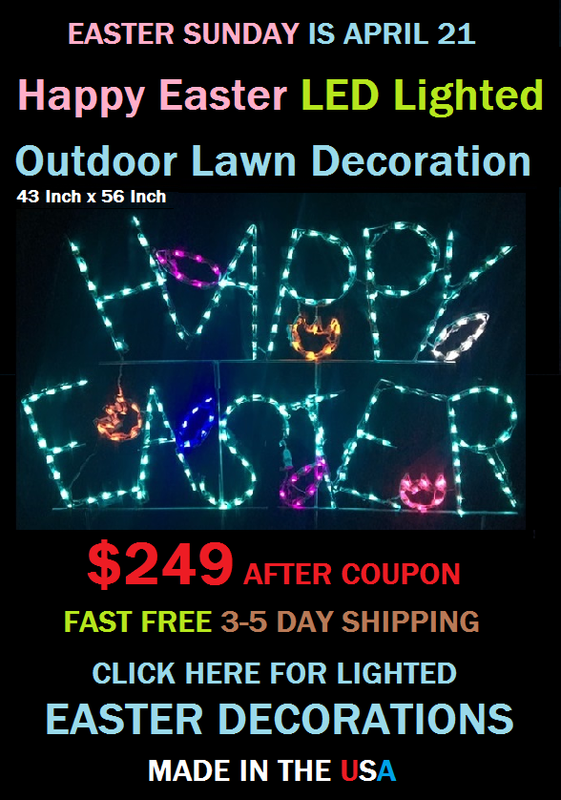 Don’t miss this fabulous opportunity to own a very festive lighted holiday Easter decoration. Until next time..